What's the best way to keep my garage from freezing? I live in Colorado. My 1950s house has a one-car attached garage that was built in the 2000s. The walls that are not shared with the house are not insulated: the studs and sheathing are visible from the inside. There is no ceiling, so above the joists the rafters and roof sheathing are also visible. There is a single steel overhead door, also uninsulated. I'd like to keep the garage from freezing because a) I store things like paint and food in it and b) occasionally I want to work out there wearing only moderate cold-weather clothing. It's sufficient to keep the garage at 50ºF/10ºC. With these goals and conditions in mind, that's the best way to install insulation in this garage? Will I have to install drywall over it? Can I use that shredded-denim insulation to avoid fiberglass countermeasures? What's the best type of heater to use? Turning a cold space into a warm space is absolutely doable, but the trick is doing it the right way to avoid creating longer term health or structural problems later. The proper way to create a warm space is to create two different kinds of protections against the elements - a thermal break to hold in heat, and a moisture barrier to hold in water. The thermal break is the obvious part - you want it to be warm, so you need to create a layer that doesn't conduct heat well and put it between your warm and cold spaces. The moisture barrier is the less obvious and yet more important part. Wherever warm air touches a cold surface you get condensation. Condensation in an enclosed space - such as inside of a wall or insulated cavity - is a bad thing, because now you're getting organic materials such as wood and gypsum wet, which turns them from construction materials into mold food. Mold being bad (read - toxic) its important to create a complete barrier that keeps moist warm air from getting into cold, closed spaces. (Once the moisture gets into the wall it wont come out again anywhere near as fast as it got in, so it'll just keep building up). The 2nd part here is you've got walls and a roof to deal with. Since you don't have a ceiling, and since it sounds like you don't really want to install one, you can treat the two the same. Thus I'll explain how to properly insulate your walls, and you can do the same for your roof over the garage. But bear in mind if you install a ceiling, then the roof has to be handled differently from the walls. So - how do you insulate your walls safely? 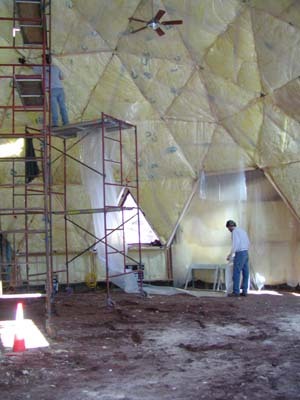 First - yes you can use shredded denim insulation, or fiberglass, or cellulose, or spray foam. If cost is your primary concern, then you're going to trade off money for time. The fastest but definitely not cheapest way to handle your problem is spray foam. 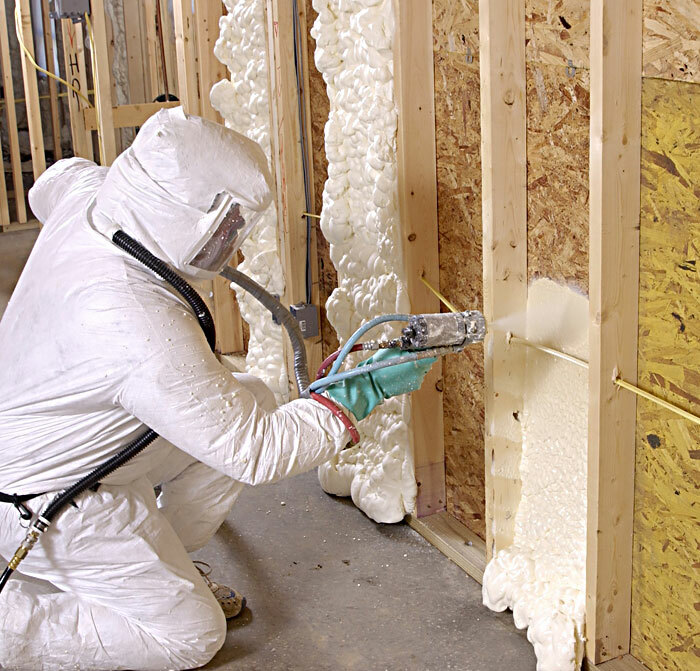 With spray foam (closed cell foam being preferred over open cell foam) you spray (or have someone spray) a liquid compound into the wall cavities and the liquid foams up and then solidifies. 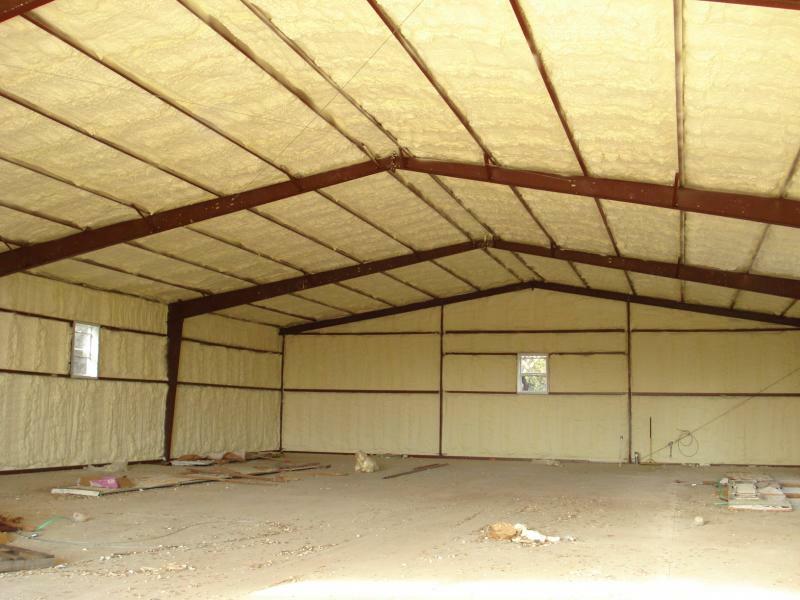 What you get is a dense, seamless, tightly packed rigid material that has excellent insulation qualities and acts as a vapor barrier all on its own. In your case you could spray the walls and roof in one day and almost instantly have a workable warm space. Flaps folded over the studs, and stapled down. (Then tape the seams for extra measure as well as taping any tears). I still also don't trust paper as a vapor barrier, though often times its paper/plastic laminate in which case it'll probably be fine. Here the plastic is hung up over top of the insulation, taped at its seams and so forth. Here's the critical bit - YOU MUST NOT FAIL TO TAPE ANY SEAMS/GAPS IN THE VAPOR BARRIER. A tiny pinhole in your vapor barrier can let in a whole cup of water in a season as warm moist air pushes into the cold space. So you have to create a completely solid barrier against moisture all the way around the edges, on all the seams, and in any tears you inadvertently create. 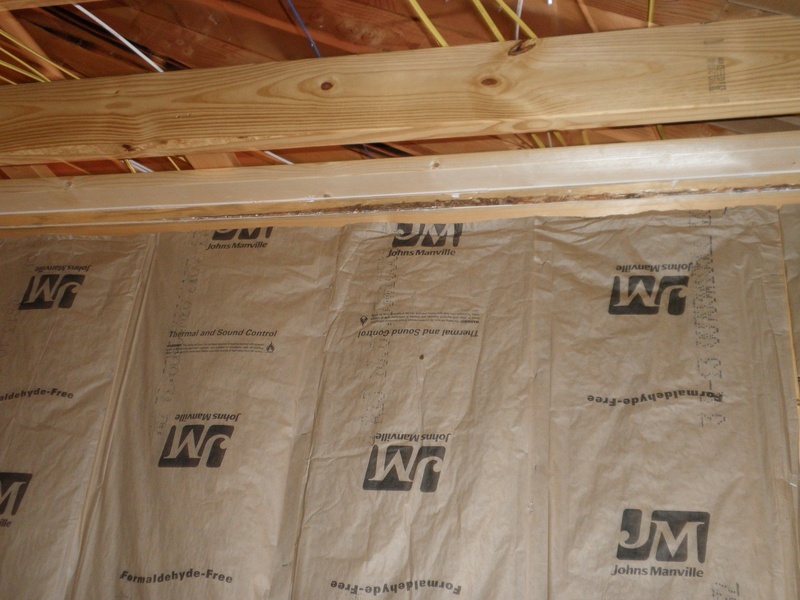 Because this vapor barrier is so important, you should drywall or protect it in some other fashion. (You want to create storage - consider sheets of plywood instead of drywall to create extra strong mounting surfaces for shelves ) If you leave the barrier exposed, it's gonna get damaged, and then its gonna lead to mold and rot. If you spray foam, however, since its rigid and 4" thick, you can leave it exposed. Insulating a garage is fairly straight forward, however keeping it constantly above freezing in an area of sustained cold temps is more involved and potentially expensive. You can easily put batt or roll style insulation in the walls, no brainer... You could install batts or roll between the rafters, but that creates a much larger volume to heat. 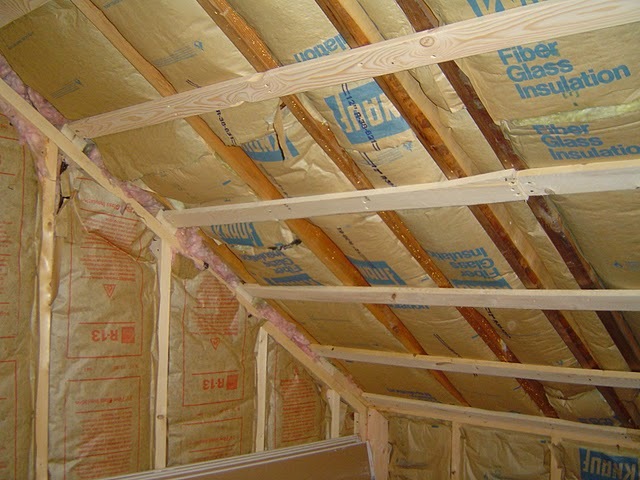 It would be preferable to install the insulation between the collar ties (ceiling joists) and add a layer of drywall, some strapping or heavy gauge (4 to 8 mil) plastic to keep the insulation from falling down. Drywall on the walls isn't required, but would be a good touch and help minimize cold air infiltration. The next consideration are your doors. They really should be an insulated door with proper tight fitting weather stripping on the top, sides and bottom when closed. If they are not relatively airtight, you will be wasting your time and money trying to heat the space. The source of heat depends on what type of heating you have for the rest of the house. Often, a separate zone is created from an existing HVAC system and run through a large space heater hanging from the ceiling. These are often referred to as a "dog house" or "moline" type heater. These are typically forced hot water driven. You can also use a 5KW electric fan forced space heater or install a vent with return for a forced hot air system. No matter what style you use, it is important to have an independent thermostat control dedicated to the garage space. Be pre-warned, heating a garage space constantly is gonna be pricey. Expect to lose a ton of heat every time the door is opened. Also be aware that the concrete floor is a heat sucker in areas where the ground freezes. We built a bucket truck garage two years ago. It has a 13' ceiling with a 5' stuccoed concrete block wall and ordinary 2"x6" studs above that. And of course the 4:12 pitch roof adds another 2' average height above that. A 15' ceiling leaves a lot of air space overhead to heat before the rest of the garage is comfortable. The garage has a 10'x10' insulated overhead door. I insulated the north wall because that wall has pegboard attached. The past two winters were very cold for SE PA and it got down to 20° F in that garage, making me rethink whether it would be worth it to insulate the ceiling. We built a two story 1,000 sq ft garage ten years ago. That I fully insulated with 6" batts, including the cathedral ceiling. It is heated adequately to 50° F with a 45 year old 22,500 BTU forced air heater in one side wall. That heater is only run at night (we pay half for electricity at night) so our annual heating cost for the garage is under $100.00. That is pretty cheap to have four cars start up warm in the winter and dry off fast (20 minutes) when they are brought inside wet. (There is a 40 pt. dehumidifier in the garage as well.) I had considered a 'trap door' to keep heat in the downstairs, but the upstairs remains much colder than the heated downstairs, even with the stairwell open, so we decided it was worth it to keep the second floor above freezing. The floor also remains warm; ice and snow don't accumulate outside the doors. We built a 3,000 sq ft barn eight years ago. That building has a finished second floor with 4" insulation in those walls, but the first floor walls are uninsulated. The 1/2" plywood ceiling has 12" of kraft faced batts. An unfinished room on the second floor got very warm with the sun beating on the west wall. That is the reason I left the bucket truck garage uninsulated on the south and west walls. (The barn may also get heat from the south and west walls.) With 8,000 cubic ft. in that garage I don't notice any heating from the sun without placing my hand on the sheathing; it is definitely warmer than of the east wall towards the end of a sunny day. The barn has six pairs of double hung high solar coefficient glass windows facing directly south. It remains 40° F in winter, except when there is rain and snow. On bright sunny days the insulated second floor approaches 70° F when it is 40° F outside. The north wall has three man doors and two barn doors. It would make no sense insulating that wall; it is all doors. My philosophy is to insulate ceilings with the highest R value practicable. In our home, which has a bare plywood floor on all but the eaves, that means only 6" R-19. My wife has augmented that with another 18" of women's clothing, shoes, spare bedding, crafts. I'm serious; there are 50 banker’s boxes and another 50 huge boxes of fairly good insulation up there. The barn has 12" R-38. The attached garage has only room for 6" R-19, but that isn't heated as a living quarter is. That leaves the bucket truck garage. It would cost $700.00 (with discount) for 9 1/2" R-30 batts for the ceiling. Doing it with some help would cost another $300.00. I have the scaffolding, plus the bucket to get up and down (My 70 year old knees can't climb ladders all day). A 1,500 watt (5,100 BTU) heater keeps it above freezing on the coldest nights. (The building is really tight.) I estimate that'd cost $50 a season; less if the winters return to normal. A portable 5,600 watt (19,000 BTU) heater needs to run 5 hours to heat the building up to 55° F. If I do that ten times a year (not likely), it would cost $40.00 a season. Rounding up to $100.00 a year it would pay to take $1,000.00 out of our investments... if we didn't have to heat it at all after we insulated. The bucket truck is worth $25,000. The pegboard on the north wall is filled with family photos, several pieces of original art and many very nice prints, etc. An 80 pt. dehumidifier in that garage runs down to 40° F, but it is not as efficient at that temperature. It would still not be worth insulating. I guess I'll keep looking for an inexpencive propane mobile home heater; half the price of electricity and typically 75,000 BTU. It'll solve the problem of what would happen if I closed in the unvented portion that would be sealed off if I insulated it. Not the answer you're looking for? Browse other questions tagged insulation heating garage garage-door or ask your own question. What are the consequences of allowing paint to freeze? How do I deciding whether to install an attic venting system? How can I keep my paint from freezing in an unheated garage? Best way to air seal, vapor seal, and insulate exterior wall in old house? How should I go about fire proofing my garage? Should I insulate the garage in the home I'm having built? What's the best way to fix a panel garage door? Should I insulate my rafters in addition to the ceiling in an unconditioned attic?